Sarai’s life story became one punctuated with journeys. First there were the physical relocations. While she grew up in one place—Ur—once she married Abram she found herself periodically going from way stop to way stop, especially since the LORD became an active part of their marriage equation. Then there was the challenge of navigating the endless cycle of hope and despair due to her barrenness. This, she was to learn, would last for almost a lifetime. Abram received direct communications from God from time to time, some of which involved picking up stakes and moving. Directives were specific: “…Brethren and fathers, listen: The God of glory appeared to our father Abraham when he was in Mesopotamia, before he dwelt in Haran, and said to him, ‘Get out of your country and from your relatives, and come to a land that I will show you.’ Then he came out of the land of the Chaldeans and dwelt in Haran. And from there, when his father was dead, He moved him to this land in which you now dwell” (Acts 7:2-3). Each time, Abram, with Sarai by his side, obeyed without question. One is left to wonder how Abram broke the news to Sarai of an impending move with a rather open-ended destination. Did he confide his encounters with the LORD early on, and in the process plant the seed that would eventually blossom into a faith which guided her life as well? Or was she, too, one of the ones who chose to shun the odious moon goddess, worshiping God only? Whichever the case, husband and wife prepared to leave. Moving a household long distance must have been quite an undertaking. According to a distance chart in the Archaeological Study Bible, Haran (also known as Paddan Aram) was 612 miles to the north of Ur, situated on an international trade route. The pace of a normal caravan was about twenty miles per day so Terah’s family could anticipate spending around one month in travel. Sarai and the other women of the household would likely have been responsible for assembling many of the provisions, especially clothing and foodstuffs. There would be containers of salted meat with a “shelf life” of about a month. No doubt grain for grinding, dried fruit, wine or beer, cheese, and oil were among the staples. Water, of course, would be a vital issue, as would provender for any livestock. According to the Collins Atlas of the Bible the normal route between Ur and Haran was never a day’s march from habitations or water (the route followed the Euphrates River, and there were settlements every seventeen miles or so along the way). So it was that one day Terah, Abram and Sarai, along with Lot, the deceased Haran’s son, set out on a journey which would be Terah’s last, and the first of several for the rest. 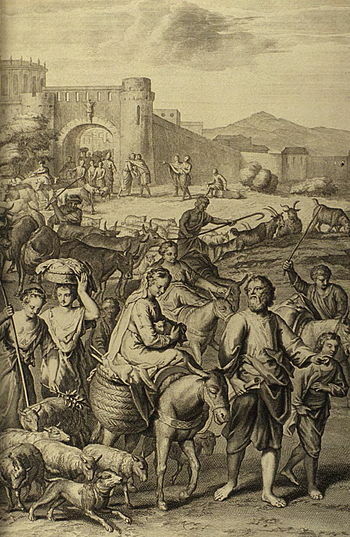 One can picture their caravan, servants leading supply-laden donkeys and manning ox-drawn carts piled with furniture and other household accoutrements, carpets for bedding, a grinding stone, and various pots and baskets filled with food and other essentials, livestock and herders, all beginning the trek in the cool of the morning. While there might have been caravansaries along the way, it seems likely that travelers often used tents, the movable habitations of the day. Relatively easy to erect and dismantle, these shelters provided a measure of safety and protection from weather and wild animals. If not on this trip, Abram and Sarai would find themselves living in tents permanently in the years to come. Haran was an important commercial center. Presumably the men had portable trades or extended business interests which could sustain the family at least in the near-term, so locating in or near a city was important. If Terah was an idol manufacturer as tradition purports, he would find a lively market in the new locale—another major center of worship for Nanna, the moon goddess. However, some speculate that the family stopped in Haran for an unspecified length of time due to Terah’s health since the Bible records that he died there at age 205 (Genesis 11:32). Next time: Travels, famine, and Pharaoh’s harem. Archaeological Study Bible (2005), Article, “Distances in Miles Between Old Testament Cities,” p. 341, and article, “Archaeological Sites: Paddan Aram,” p. 48. Ibid. See note on Genesis 12:5, p. 21. Collins Atlas of the Bible (2003), p. 31. Posted in Abraham, Barreness, Caravans, Caravanserais, Haran, Mesopotamia, Sarah, Sarai, Terah, Uncategorized. Bookmark the permalink.